And, according to Amazon, that means the end to lower cost Prime membership. 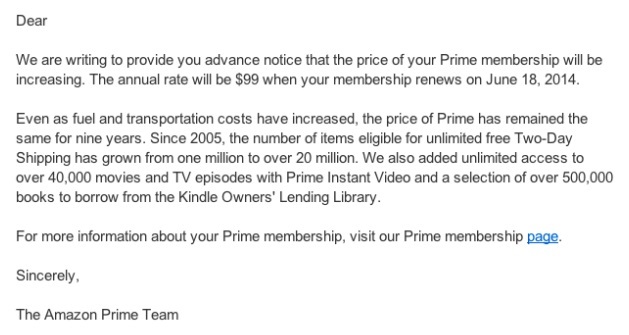 The company recently notified Prime Members that their annual memberships will go up by $20, citing increased fuel and transportation costs as part of the reason. Prime members whose subscriptions renew prior to April 17th may not see this increase, at least not this year. However, if your membership expires after that, be prepared to pay a higher fee. You may have noticed that Amazon also (quietly) raised the minimum purchase to $35 from $25 to qualify for free shipping. There are rumblings online, of course, about this increased fee. Some are unhappy, while others see it as a necessary increase, as the company has not raised this cost since its inception. Amazon has a good thing going, but all good things must come to an end, or change, to continue to keep Amazon at the top of their industry. In December, I recall Amazon boasting about their one million (or close to it) new Prime membership subscriptions. While quite impressive, I wonder how many of those customers took the trial to help with their holiday shopping, especially if time got away from them and they were doing a lot of last minute shopping, and then canceled before the trial was over. That might play a part in Amazon’s decision to raise prices, as this may have cost the company more than they anticipated, hoping that more of those free trials would turn into subscriptions. I also think they pushed the envelope a bit with their promotion where customers could order as late as December 23rd or 24th and get same day delivery. With a Prime Membership, the additional cost for this was very minimal as I recall. The factors above, coupled with the ever increasing cost for such things as fuel and transportation, likely played a part in Amazon’s decision. They do have a great model, and I’m not anticipating that the company will see a huge fall off in their Prime Members. Today’s customer is so into immediate gratification and quick purchasing processes that I think Amazon still has a good thing going, but perhaps they pushed it too far during the holidays and are now seeing the need to scale back and make sure their processes aren’t hurting them financially. What are your thoughts about Amazon’s price increase? Necessary or greedy? Do you think that their holiday push hurt them in any way? We’d love to hear your thoughts – comment below and join in the discussion!